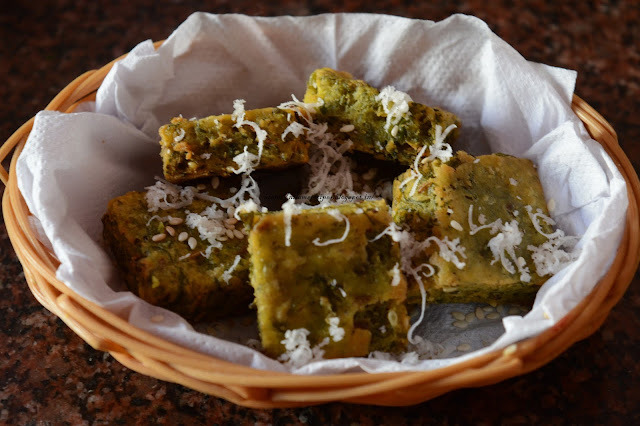 Moong usal is a Maharastrian dish made of sprouted green gram. Loaded with lots of nutritional health benefits, this low calorie food is a great source of proteins, vitamins and minerals. High in fibre and low in cholestrol, easily digestible Green Moong is an ideal food choice for the diabetics and elderly. To give it the authentic taste and flavour of Malvan, I have added coconut and Malvani masala to this Moong Usal. Keep hunger at bay with this delicious and easy to make Moong Usal that will surely become your family’s favourite, of your younger ones too! Sprout the moong in advance to make the usal. For preparing masala paste, heat oil on a tava, add onion and saute till translucent. Add freshly grated coconut till brown, fry this masala on a low flame. Once done remove from flame. Heat oil in a pan, add the chopped onion and saute it. Now add the sprouted moong, malavani masala, turmeric powder and mix it well. Once the moong is cooked properly, add the coconut masala and mix well. Add salt and cook for 5 minutes. Do not overcook the moong beans, as overcooking will reduce its taste. Moong Usal it ready to serve. 1) For preparing masala paste, heat oil on a tava, add onion and saute till translucent. 2) Add grated fresh coconut till brown, fry this masala on a low flame. 3) When this masala cools down, grind it to make a paste and keep aside. 4) Heat oil in pan add the chopped onion and saute it. 5) Now add the sprouted moong, malavani masala, turmeric powder and mix it well. 6) Add little water and let it cook for 5 minutes. 7) Once the moong is cooked properly add coconut masala and mix well. 8) Add salt and cook for 5 minutes. Do not overcook the moong beans, as overcooking will reduce its taste. Check the taste of usal and if required add salt and masala as per your taste. 9) Moong Usal it ready to serve with chapati or ghadichi poli, poori or plain rice.